Define the metrics you’ll use to measure success. Develop your mobile device and security policies. You’ve probably heard the saying, “If you build it, they will come.” But when it comes to rolling out new technology to your users, nothing could be further from the truth. Executing on a project is as much about preparing your users for the new experience as it is about the technical steps to implement it. So in this stage of the rollout process, you’ll learn what it takes to plan a successful launch. During the planning stage, you might be responsible for organizing and executing the entire rollout by yourself, or you could be working with a Project Manager or the Change Management department at your company. Regardless, your role is critical. As an admin, you’re more than just a builder of reports, a creator of fields, or a resetter of passwords. You are, in fact, your company’s trusted Salesforce advisor. And when it comes to the Salesforce app, you’re responsible for making your company’s mobile dreams come true. We talked about setting up your rollout team in a previous unit. After they’re all on board, create a Chatter group and invite the team members involved with your mobile launch. Using Chatter, you can share files, collaborate in context, and share relevant updates with the whole team. One of the key files to share with your team members is a project schedule. Keep the schedule updated, and post a link to the schedule in your team’s Chatter group. Pick your launch date wisely! Think about aligning your launch to coincide with your company’s sales kickoff meeting or another large company event where you can get organic exposure for your rollout. Avoid holidays and confirm stakeholder availability in advance. If a key stakeholder is on vacation for three weeks leading up to your launch date, consider revisiting your selected date! 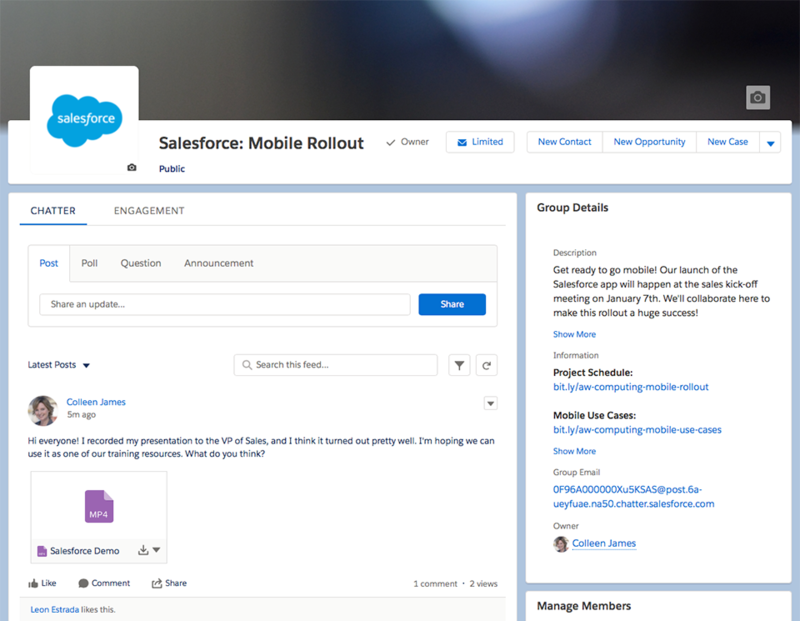 Take this opportunity to review your existing Salesforce roadmap and clear any projects that might compete with your rollout. Work with your executive sponsor to clear any roadblocks, such as competing non-Salesforce projects that require resources you need for your rollout. If your rollout looks especially complex, you may need to advise your company to put other projects on hold until this project is complete. Now that you have a launch date, you can work backwards and create a project schedule that’ll help you hit your target. Start by listing everything you need to do before you go live, and then estimate the time and resources needed for those activities. Come up with a timeline for the completion of the tasks, get your team, and then go do all of it. Doesn’t that sound easy? Yes, it will definitely take some time and coordination, so be sure to use your favorite spreadsheet or project management app to manage all the milestones and tasks associated with the project. Rolling out the Salesforce app could take you anywhere from a couple of weeks to a couple of months. The time it takes can depend on several factors, including the complexity of your organization, the size of your user population, your company’s approach to change management, or if you’re a new customer implementing Salesforce. One of the key tasks you need to complete during the planning stage of the rollout is identifying your measures for success. This is how you’ll know if your project was successful, based on the criteria you define for what success looks like. You could also measure success based on employee or customer sentiment, using a survey app from the AppExchange to collect feedback, or simple Chatter polls to survey employees quickly. Another possible metric would be user adoption, so you could look at logins and usage data. Whatever metrics you define, be sure to conduct a baseline survey or take an analytic snapshot in order to measure any increase or decrease following your go-live. We’ll discuss methods for measuring success in a later unit. At this stage, you just need to work with your project team to outline the specific measures you want to monitor. Before you roll out the Salesforce app to your organization, you need to develop your company’s mobile security and compliance policies. Every organization is different, and policies will differ greatly based on company size, industry, and culture. We’ll cover the fundamentals here, but be sure to check out the Salesforce Mobile App Security and Compliance module prior to your mobile launch. It’s the best way to learn how to secure the mobile app, keep your company’s data safe, and control access to Salesforce from mobile devices. One of the first things you need to decide is whether your users will access the Salesforce app from their own personal devices or company-issued devices, or if you want to provide both options. If you allow employees to use their own devices, you should develop a Bring Your Own Device (BYOD) policy that outlines your company’s rules and responsibilities regarding those devices. Regardless of whether they’re owned by your company or the user, you need to make sure all devices meet the minimum platform requirements for running the Salesforce app (see the resources section). The Salesforce app provides enterprise-grade security right out of the box. You can control policies like session timeouts, PIN code enforcement, offline data storage, IP white lists, and many other settings using Connected App Policies. Sensitive information is always stored in an encrypted database that is also encrypted by the mobile operating system. You can also use the Salesforce app in combination with Mobile Device Management (MDM), also known as Mobile Enterprise Management (MEM). These tools help you manage BYOD policies, provision devices with pre-installed apps, push enterprise identity certificates, install VPN profiles, monitor traffic, and direct access to an enterprise app store. Using MDM can be beneficial because it provides the ability to push the Salesforce app to your users, or to automatically set their custom login hosts for convenience. And if you’re in a highly regulated industry, you might need to completely lock down corporate devices to ensure legal compliance. Only you can decide whether your company should use the Salesforce app on its own, or along with MDM. If your employees currently access the full Salesforce site using single sign-on, you probably need to make some changes in order for it to work properly with the mobile app. Review the instructions for configuring your single sign-on integration, and be sure to test the Salesforce app with your SSO solution before you go live. OK, now that you’ve got a plan in place, you’re ready to start communicating the mobile rollout to your company.